About a week or so ago, I received a flyer in the mail announcing the coming of the Liberty Belle -- a restored, airworthy, Boeing B-17 bomber dating from World War II. She was going to be at nearby Rocky Mountain Metro Airport (formerly known as Jefferson County Airport), right down the road. Rides would be available. There are a handful of these flying specimens touring the country at any given time and they serve to remind people of the sacrifices made by the so-called Greatest Generation and to preserve the legend of these magnificent aircraft. The usual deal is you make a reservation to fly in the thing, pay your money (in this case, $450 for a 30-minute flight), and enjoy a very unique aviation experience. The money goes toward offsetting the enormous operating costs associated with flying a four engine heavy bomber manufactured over sixty years ago -- when the word "hybrid" was never applied to an automobile -- while you get to launch into the wild blue yonder in a piece of friggin' history. Not a bad deal, considering. The typical passenger profile ranges from curious thrillseeker, to aging veteran, to child of some crewmember who never made it back from those very dangerous skies over Europe in the early 1940's, when the B-17 -- A.K.A. the "Flying Fortress" -- was plying her trade. I've seen video interviews of passengers filmed during and after these flights, and their testimonies are always enlightening, but the ones from the kids of these crewmembers will always, always make you a little misty. Now, $450 for a half-hour ride is a little rich for my blood, especially for a flight wherein I don't get to actually fly the damned thing. So I immediately opted out, but I stuffed the date in the back of my head. After all, I had already mentally mapped out the ideal flight plan for a 30-minute sightseeing flight from Jeffco, and it would have taken the flight northwest, directly toward Boulder, then along the Front Range toward Longmont, and then, with a nice sweeping turn back to the southeast, back toward the point of origin. And that's exactly what the Liberty Belle did, all day today. The Liberty Belle, now showing in Boulder, Colorado! 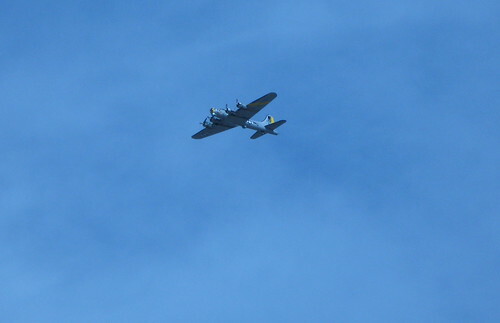 I grabbed my camera and ran from my deck to the front porch like a maniac every time the plane came by on another run. Seeing the object of one of my many infatuations flying past the mountains that have become my latest love was nothing short of breathtaking. I took a few shots, that will appear to most as pictures of mountains with a speck in the sky. But I know what that speck is, and now so do you. I went for a bike ride shortly after the third run, but the 'Belle continued to fly, and I annoyed my riding companions every time she flew by, imploring them all to look up and watch this magnificent assemblage lumber past. If you're in the area and are so inclined, the 'Belle flies again tomorrow. I'm hoping for better sky conditions and the chance for a few more pictures, myself.